The Electrified Mind helps therapists understand and empathize with patients who rely heavily upon cell phones and the internet for the purposes of self-expression as well as for defensive avoidance of actual interpersonal contact. 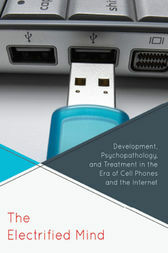 The chapters by distinguished mental health professionals delineate therapeutic strategies for dealing with the dilemmas that arise in working with children, adolescents, and adults excessively involved with cyberspace at the cost of meaningful human relationships. Each day the rapid advance in electronics seems to bring with it another new technology which can capture and even monopolize the attention of our patients, our children, and ourselves. In The Electrified Mind Dr. Akhtar has assembled a fascinating collection of highly readable papers which examine the developmental, cultural, and therapeutic aspects of this ongoing transformation of the way all of us learn about and relate to each other and the world.